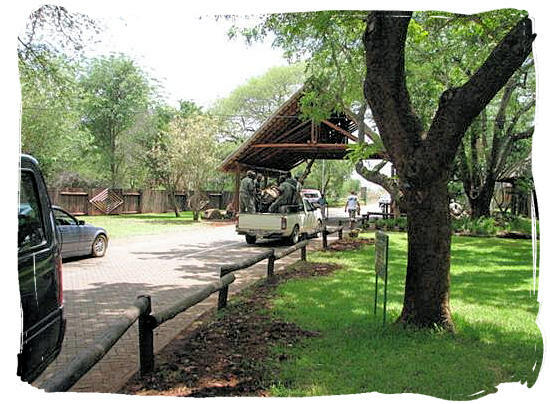 Crocodile Bridge Rest Camp in the Kruger National Park. 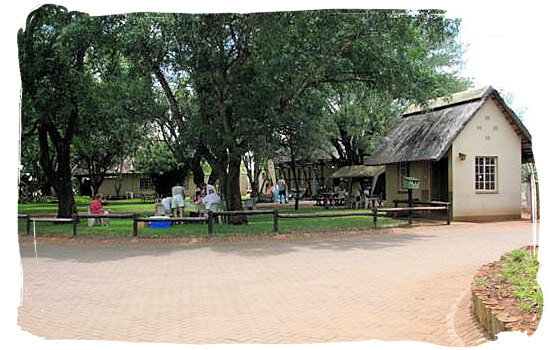 The region surrounding the Crocodile Bridge rest camp is part of what is called the "Southern Circle". This is an area in the southern part of the Kruger National Park which is famous for its many Lions and outstanding game viewing. 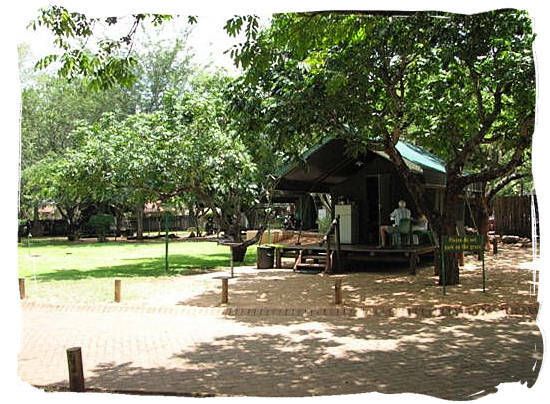 This third smallest and delightful camp on the northern bank of the Crocodile river from which it derives its name, is situated in the south eastern corner of the Kruger National Park, not far from the border with Mozambique. 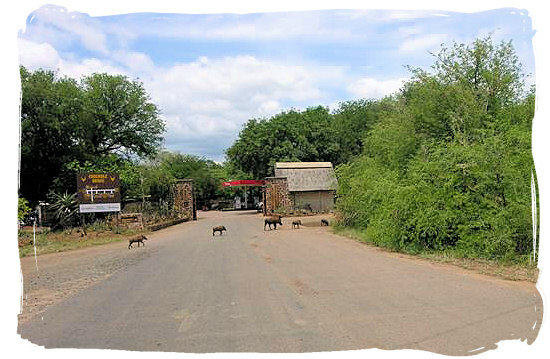 It is both a rest camp and an entrance to the Park, although the camp itself is a few kilometres into the Park away from the gate itself. 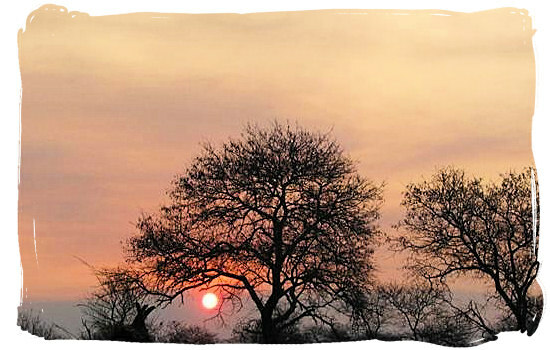 To the east of the camp lies the Lebombo mountain range, which is the eastern boundary between the Park and Mozambique. 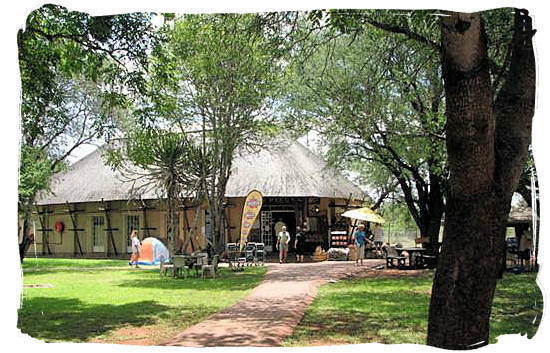 The Crocodile Bridge rest camp and the region surrounding it is known as one of the top game viewing regions in the Kruger National Park. As part of what is called the "Southern Circle", the area is famous for its many Lion prides and an abundance of Giraffes, Zebra and Antelope species. Leopards and Cheetahs are seen regularly. The region is also home to a large percentage of the Kruger National Park's Rhino population. The vegetation in the area surrounding the camp consists mainly of Knob thorn and Marula bushveld on basalt soil. Other prominent trees include the Round-leafed Teak. The grass is sweet thus attracting many grazing species. Immediately west is a zone of Delagoa thorn thicket on ecca shale soil. Prevalent trees here include the Delagoa thorn and the Magic Guarri. The grass is still sweet, but shorter. Birders should be on the look-out for the rare Pinkthroated Twinspot, which is present in this area. Blackbellied Starlings have also been seen. The rest camp is said to be the only reliable place in the Kruger National Park to see the Yellow-rumped Tinkerbird (Golden-rumped Tinker Barbet), which is relatively easy to locate in the camp by its monotonous call. The camp itself is alive with bird activity (Look for White-crowned Shrike, Bronze Mannikin, Scarlet-chested Sunbird, Orange-breasted Bush-shrike and Black-backed Puffback), Also look for the Orange-breasted Bush Shrike, the Brown-headed Parrot and a host of small ground feeding seedeaters such as Waxbills, Manikins, Fire finches and Widow finches. The short drive down to the river causeway is always good for water birds. The rest camp provides a number of amenities that will contribute to your comfort during your stay in the Kruger National Park. The camp falls within the mobile telephone reception range. Self-catering facilities are available for the independent camper. The accommodation at the camp consists of camping sites, budget safari tents, and bungalows, catering to a variety of guest requirements and needs. 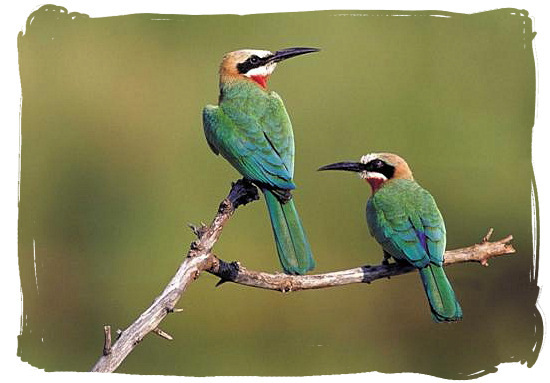 It will particularly suit those guests who are looking for a self-catering bushveld experience. All accommodation, ablution and kitchen facilities are cleaned and serviced by cleaning staff on a daily basis. 18 x tent or caravan sites, with power point and rotating "braai" (barbecue) grids. Communal ablutions and cooking facilities (24-hour boiling water, electric hotplates and washing up facilities). Maximum of 6 persons per site. 8 x 2-bed permanent furnished canvas tents (one accessible to wheelchairs) with shower, a fridge, standing fan inside tent and small veranda. Communal ablutions and communal kitchens available. 20 x 2 or 3-bed, round rondavel type units, equipped with en-suite bathrooms (showers, no baths) and air-conditioning. Kitchenettes have hotplates and sinks. Two units are fully accessible for people using wheelchairs. After an early morning game drive, one can retire from the Low-veld heat to a nice lunch with something ice cold to drink and a siesta before coming back for late afternoon game viewing. 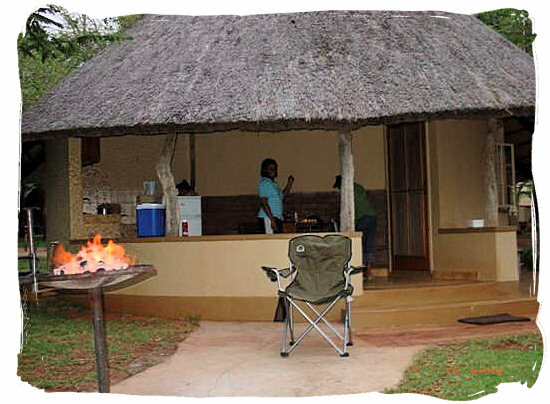 Crocodile Bridge is an ideal camp from which to pursue the Big Five and both Rhino species. 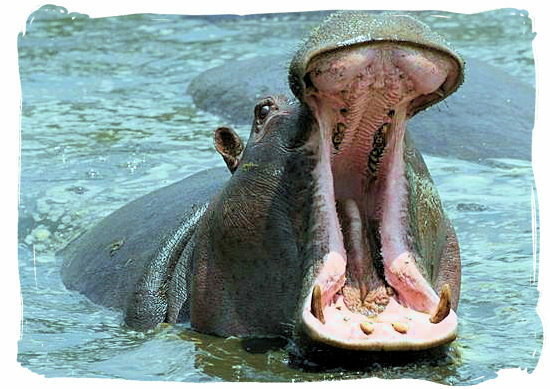 Five kilometres from the camp visitors may leave their vehicles for a short walk to the river to watch (among other things) Hippo and Crocodiles lazing in the pools and basking on the sandbanks. One of the attractions the camp are the San (Bushmen) paintings which adorn an overhanging sandstone rock near the Hippo pool. They are remnants of the San People who once lived and hunted in this area. 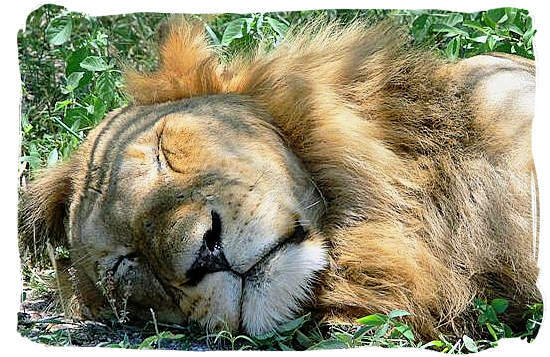 These and other activities will ensure an exciting bush experience. All bookings, as well as further details about these activities are available from reception. The rest camp has virtually the same climate as the Berg en Dal rest camp, with occasional bursts of quick summer storms (which can be quite heavy) occurring later in the day, cooling the air and settling the dust. The summer months (October to April) are hot and often quite humid. Winters are warm and mild with cool evenings. Visitors going on night drives during the winter period may require warm clothing. The closest airport to the camp is Kruger Mpumalanga International Airport (KMIA), which lies between Nelspruit and White River. 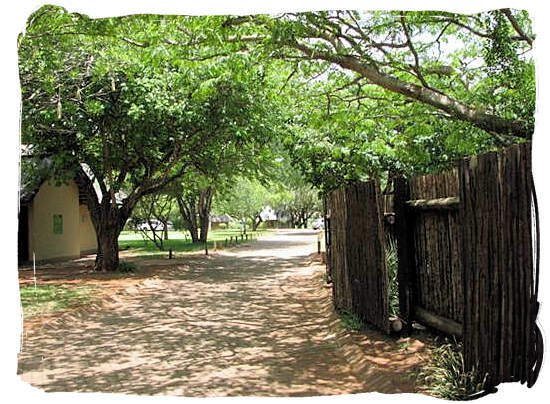 KMIA is situated approximately 25 km from Nelspruit and about 120km from Crocodile Bridge gate. There are daily scheduled flights between Kruger Mpumalanga International Airport and OR Tambo International Airport at Johannesburg, with less frequent flights from Cape Town and Durban International Airports respectively. Take the N4 to Nelspruit. Continue with the N4 via Nelspruit to Malelane and on to Komatipoort (about 110km). Then turn left onto the R571 just after Komatipoort and head to the gate. Travelling from Johannesburg or Pretoria, allow between 5 to 6 hours for the trip to the gate. Crocodile Bridge is right at the gate. When you click on the accommodation type, you will see the facilities and content of that particular accommodation unit. The accommodation code enables you to book a specific type of accommodation, if you provide it with your booking. Go to SANParks.org to book your reservation for the camp in the Kruger National Park on the official reservations page of the South African National Parks organization's (SANparks) website. Go to SANParks.org to view the tariffs applicable for the camp on the official tariff page of the South African National Parks (SANparks) website.